The word “supergroup” has lost meaning in the music world. It’s been replaced by words such as “side project” or “collaboration” or “a bunch of friends.” Without trying to sound too curmudgeonly, they just don’t make supergroups like the Traveling Wilburys anymore. The closest thing we’ve gotten in the last few years was Jay-Z and Kanye West’s Watch the Throne. No doubt it was huge, but we all knew it was a one-time thing. While Kanye and Jay-Z are friends, both of them promote their own brand above all else. Other “supergroups” leave out the “super,” with the likes of Broken Social Scene and Divine Fits only causing dorks in glasses to swoon. Mind you, they’re both great bands, but “super” implies something bigger than we can comprehend.And so we come to Moderat, a “supergroup” that puts that word six feet under. The band is a side project (and yes, it should be called a side project) of Berlin DJs Modeselektor (Gernot Bronsert and Sebastian Szary) and Apparat (Sascha Ring), two groups that (“both” along with the previous use of DJs implies each DJ is one person, but below you say Modeselektor has more than one member. Consider changing to “Each act encompasses” or something more plural) encompass very different facets of the dance landscape. While he’s had quite a good career on his own, Apparat may be most well-known for his collaboration with Ellen Allien on the fantastic Orchestra of Bubbles, a comparison that Moderat is doomed to lose. Apparat leans towards the atmospheric and emotional, creating arrhythmic soundscapes that he can float his voice over. The music is crisp and clear, focusing on beauty and precision. Modeselektor, on the other hand, revel in their bump-and-grime distorted bass, middle fingers to the sky, snickering when anyone calls them “serious artists.” It’s an odd couple, but somehow it has worked well enough for them to make two albums. They recently released the aptly named II, a solid sequel to their debut album.Apparat and Modeselektor forgo shaking hands across the aisle, instead going for a classic push/pull dynamic. Listening to the music, you can almost imagine them fighting over the soundboard. Often it sounds like Apparat interrupts Modeselektor, and vice versa. Take “Milk,” the longest track on the album by far, clocking in at a stately 10 minutes 4 seconds. It starts with a slow, spirited bassline that’s pleased to repeat itself ad nauseum (one of Modeselektor’s calling cards). A few minutes into the track though, reverb descends like a warm blanket, muffling the bass. Discordant drones take over, and the song opens up into a huge world of echoes. Apparat has arrived, and damned if he’s going to wrestle over the controls. It all works out in the end, with both motives able to live together in harmony, riding the groove until the inevitable cooldown. The changing dynamic makes “Milk” an enjoyable marathon instead of what it could have been: an overpadded slog. Where the album shines, though, is in the tracks fronted by Apparat. It’s rare for a producer to have such a powerful voice—most producers have guest vocalists do the belting—but Apparat is one of those exceptions. His voice is light and airy, much like his production, but it’s also evocative, occasionally rising to a heady falsetto to add some nice emotional oomph. Lead single “Bad Kingdom” is the perfect example of this. Apparat takes his hands off the mixing board and bogarts the microphone, singing about a person’s sorrowful downfall. “This is not what you wanted/Not what you had in mind,” Apparat wails, singing through Modeselektor’s trademark slimy bass. The production is beautifully ugly, and a perfect foil to Apparat’s clean vocal take. It’s not really Moderat at this point. 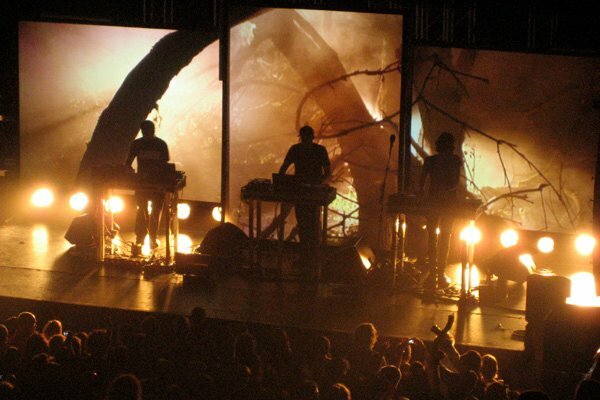 It’s more Modeselektor featuring Apparat, digging the notion of a supergroup deeper into its grave.While “Bad Kingdom” may be the big single, the choice cut on the album is “Gita,” another track featuring Apparat’s voice. It has all the winning elements of “Bad Kingdom,” but with a better beat and a bit more crooning. Apparat’s voice gets chopped and screwed, popping in at random intervals to say a solemn syllable, while the beat drives on and escalates. “Gita” sounds exactly like what a collaboration with these artists should sound like. It’s dense and complicated, worth a few listens just to parse out all the little details. Sadly, II doesn’t get much higher from there. The album is considerably front-loaded, and even some of the more enjoyable early tracks wear out their welcome. To make a good, repeatably listenable electronic album, the artist has to keep the listener guessing. Counterpoint is a producer’s best friend, combining disparate sounds that lock into a groove once the beat kicks in. It’s a tried and true strategy that’s guaranteed to get a crowd going. One good groove can only do so much for an entire track. For example, “Ilona” has a nice start, but it doesn’t progress much from there. The loud/soft dynamic has its limits, and when one uses that to carry a song, eyes start to glaze over. Same can be said for “Versions” and “This Time.” Each of those tracks could’ve shed a few minutes and no one would notice. The grooves just aren’t tight enough to go the distance. Even Apparat’s vocals can’t buoy the uninteresting “Damage Done,” with the repetitious line of “I see the damage” only fodder for harsher critics. (“Yeah, I see the damage done to this track. Heyo!”)Reportedly, Modeselektor and Apparat have only worked together three times up to this point in their careers, two of those times spent working on the two Moderat albums. So II is not bad given their inexperience with each other. The album has its moments, and that’s good enough. Good, not great, but not dreadful either. We can’t expect every group to be the next Daft Punk, releasing paradigm-shifting albums whenever they want. Hell, even the vaunted Traveling Wilburys never really put out anything that lived up to each individual band member’s potential. Pick II up for the hits, but understand that it has its share of misses too.